Greece will still plague the headlines for these few days! It seems like a 5 year old novel talking about Greece debt problems. So what is the real problem and opportunity now? Euro group are now in negotiations with Greece to see if they want to lend money to Greece to prevent it from defaulting on its payment due on 30th June 2015 to IMF, International Monetary Fund. Even if there is an agreement, Wallstreet is also worried if there is enough time for Greece to receive payments to pay the IMF on 30 June. Greece must either get a program extension, which requires approval by the involved institutions as well as several European parliaments, or agree on a new program that would include or replace the remaining funds from the old program. 1) If there is an agreement reached this week, the stock market will finally be clear of any economic uncertainties on Greece for these few weeks! For me I would start to buy up some fundamentally strong earnings stocks! This is one chance to buy up stocks at very cheap price! I believe even if Greece defaulting, it won't hurt the European banks like in the past as a lot of European banks have already minimize their risk exposure to Greece holdings. Wait for one to two weeks after the tumble to buy up the stock. In summary, in the LONG run, I don't think any Greece episodes will cause a big dent in the stock market! The whole world is already prepared for a default! DBS selling its first covered bonds! Reminds me of subprime crisis of 2008! Recently, DBS has begun to sell a type of financial instrument called "Covered Bonds". 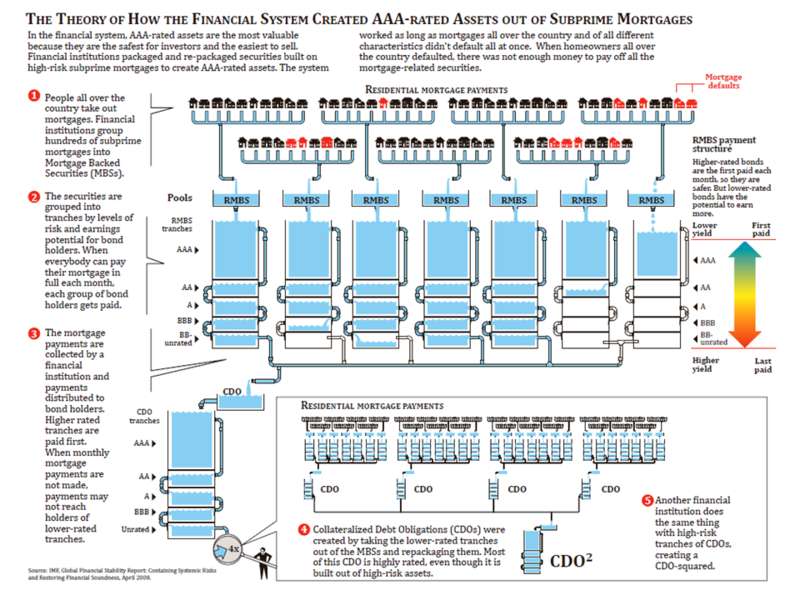 "Similar to other countries where covered bonds have been issued, DBS' program establishes a special purpose vehicle to hold the cover pool assets -- mortgage loans originated by DBS that are secured by private residential properties in Singapore -- and to guarantee the covered bonds." DBS is using the mortgage payment of Singaporeans to guarantee the bonds?! If you happen to search Wikipedia, this is exactly what bring down US in 2008! As our housing prices get higher and higher, I am betting that a bubble in Singapore is brewing in the next 10 years. Although this may be the first for DBS to issue its first mortgage backed security, I don't think it will be the last. If this instrument gets more and more lucrative, I am sure DBS will issue more complicated MBS and take higher risk. OCBC and UOB will also follow! Greed will soon creep in just like what happened in US before the subprime crisis. In future, they may be selling something that not the common folks or even the other financial houses can understand. And ratings agencies may just give a AAA rating because of the good "stable" housing prices, ignoring the risk of a housing collapse. Of course let us just hope all ends well. 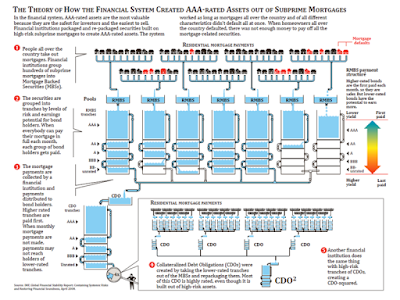 However that is also what the US financial banks and institutions thought in 2007! 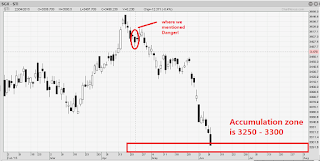 As STI entered our buying zone of 3250-3300, there are great opportunities to pick up some good fundamental stocks that are oversold. 1) What are the 5 good fundamental stocks you can watch out for in 3Q 2015? As STI entered our buying zone of 3250-3300, there are great opportunities to pick up some good stocks that are oversold or have rebounded. 1) What are the good fundamental stocks you can watch out for in 3Q 2015? 2) What are the stocks that are poised for a rebound together with the index? We are right to say Sell STI on 22nd April! Now is time to look at STI and KLCI again!!! In the article, we mentioned a that time that "STI is hovering around the 3,500 range and it is a sign that share prices are getting a little too inflated at the moment. As such, it is not an ideal time to enter the market for investors that want to ride the uptrend. At that time, I do think that STI will face a correction soon, probably somewhere around May. In fact, not only STI, at that time we do think all indices like London's FTSE100, Germany DAX, Malaysia KLCI, US DOW all have a good chance of correcting in May! In fact all has corrected. STI has gone from 3550 to 3295. FTSE100 has gone from 7100 to now 6785. DAX has gone from 12400 to now 11050. 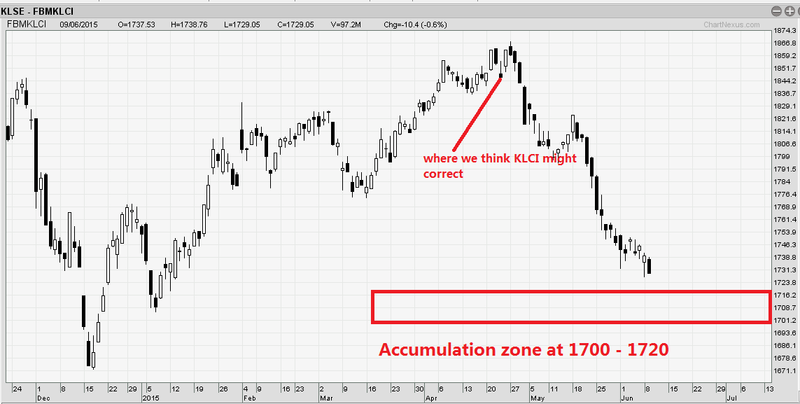 KLCI has gone from 1870 to now 1730. US Dow has also corrected from 18300 to 17760. 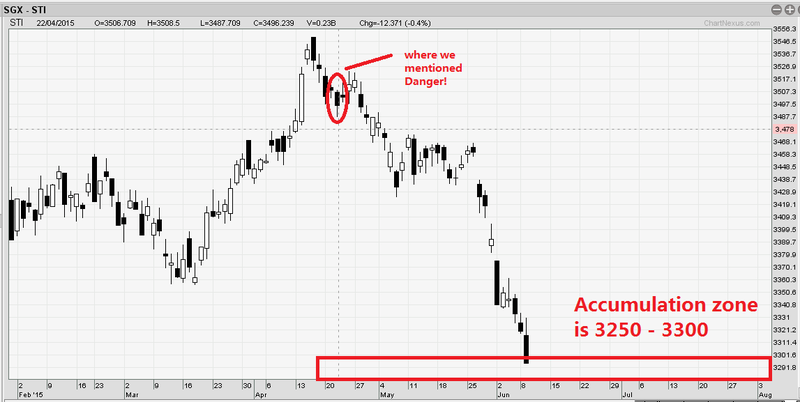 The good news is that we do think that some indices might reach a bottom soon! We do think now may be the time to look at STI again! STI buying zone is from 3250-3300! Test the market by accumulating a bit of STI index stocks or STI ETF now at 3300. Should it drop to 3250, accumulate again. To me this is again a very good opportunity! We do think that STI may still go back to 3550 again in this second half of the year! 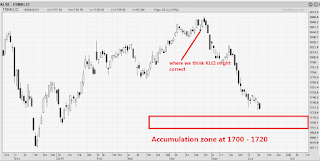 For KLCI we have a target price of 1700-1720. Let us see if it reach soon! Time to take out your weapon again!!! Do remember that money is always made when price is cheap, not expensive. Some indices have finally turned cheap now!